Learn Forex Course: We have two very exciting days planned for you which will help you to achieve your financial independence goals, understand how the Forex market works and how you can take part in it. SmartCharts Setup with Full License: SmartCharts software regarded as ‘the latest innovation in trading technology’ simplifies the trading process by adding a level of interactivity, functionality, performance and ease of use never before seen on other trading platforms. SmartCharts also has an inbuilt journal feature, trade alerts and helpful video guides which have all been implanted into the software to ensure that you are getting the very best from your education and software. Coaching Sessions: You will receive 3 thirty minute coaching sessions. Your 1-2-1 coaching sessions may be taken onsite on our Live Trading Floor or remote through Skype. You will be assigned a coach and be able to book your 3 thirty minute coaching sessions immediately following the course. A popular choice, is taking two coaching sessions back to back for an hour long session. Your 3 thirty minute coaching sessions must be booked within the 6 weeks following the course as it is important to be coached by a professional trader straight away. Lifetime Access to our Graduate Website: The Graduate Website contains lots of useful information to help you prepare for your Learn Forex programme. 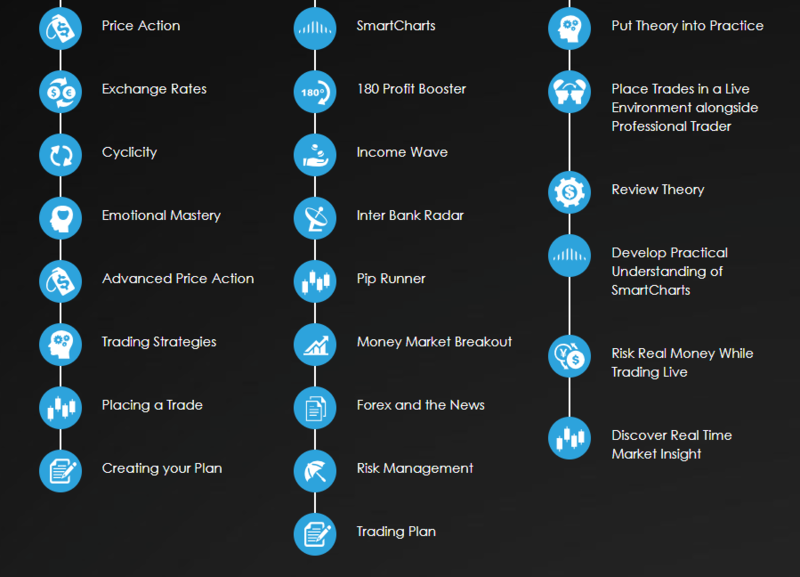 You will be able to access all pre-course set up information including opening a trading account and subscribing to your SmartCharts charting software. USB Home Study Programme: To help you get started before your course we encourage you to watch this video tutorial to give you a basic understanding of trading terminology and knowledge of the Forex markets. Pens, Pencil, Eraser, Water Bottle, Ruler and Calculator. Please bring your laptop along to day 2 of the course. You will receive your course manual following registration on day 1.